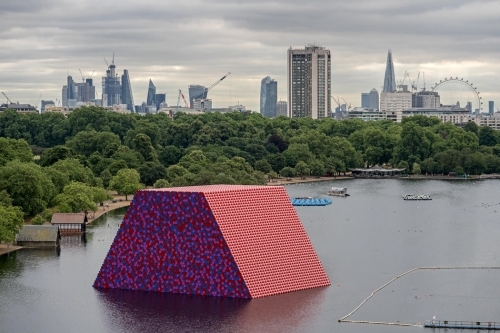 Christo has created a temporary sculpture in Hyde Park, London, titled The London Mastaba, Serpentine Lake, Hyde Park, 2016-18. It will float on the Serpentine Lake from June 18 to September 23, 2018. This is Christo's first major public, outdoor work in the UK. The temporary sculpture coincides with an exhibition at the Serpentine Galleries of Christo and Jeanne-Claude's work (June 19 to September 9, 2018), which includes sculptures, drawings, collages and photographs spanning more than 60 years. The sculpture and the exhibition both draw on Christo and Jeanne-Claude's history of using barrels to create works of art.